Guinness World Beer Drinking Record set in 1977: What were the techniques used to set the record? What were the Techniques used to set the record on June 22, 1977 in Carlisle, Pennsylvania? Techniques used to establish the World Beer Drinking Record for 1 liter of beer (33 ounces) in 1.3 seconds on June 22, 1977 at the Gingerbreadman in Carlise, PA. This webpage will document the techniques I used to set the world record. The Guinness World Record was established at the Gingerbreadman bar in Carlisle Pennsylvania (near Dickinson University and the Carlisle War College) in June 1977. 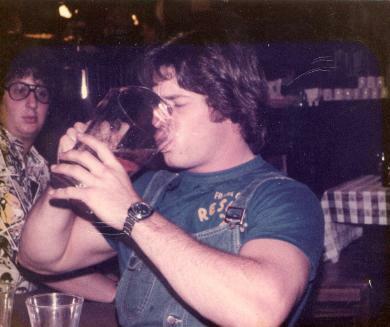 My 1977 world record was 1.3 seconds for 1 liter of beer (Miller beer), and the record was never beaten, so I am still the world record holder. Today, I'd prefer to drink a Guinness draft, but much slower. When you drink beer at these speeds, all you get is the after-taste and the brain freeze (if you make the mistake of drinking very cold beer). 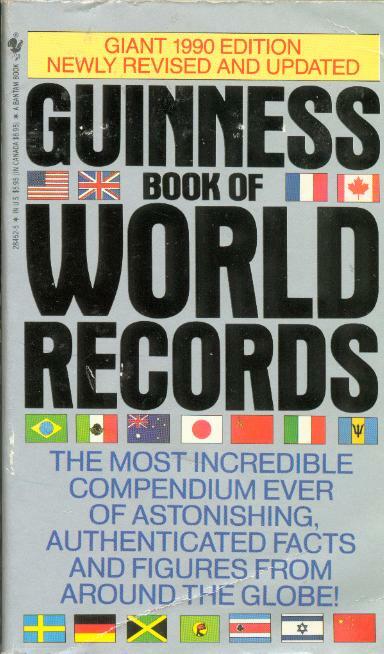 Guinness dropped all beer, alcohol, and food consumption records from their record book in 1991, so essentially, the record became a permanent but "retired" world record in that year. I am not sure what their plans are to include such records again in the future, but believe the records were removed because Guinness was sued by individuals or families of individuals who harmed themselves trying to beat these types of records. What were the Techniques I used to establish this world beer drinking record? Drink warm beer: Cold liquids constrict the throat, slowing drinking times. Early beer speed drinking records (by Peter Dowdswell, and others) were set in England when participants consumed the the relatively warmer english-style brews, compared to the heavily chilled American-style beers. Drink flat beer: Allow the beer to go flat (i.e. lose its carbonation--English-style east-tap beers are less carbonated than American beers such as Budweiser, Schlitz and Miller, which were commonly preferred US beers at the time I set my record in 1977). Engineer the drinking vessle using principles of fluid dynamics While working on my Master's Degree at Penn State, I studied the vessels with the best design for emptying themselves of fluid. Interestingly, the pilsner glass is best, since its bottom is the point of a cone rather than the circular area enscribed by the bottom of a cylinerical vessel such as a beer mug or standard water glass. The point of a cone (the pilsner glass) offers a tiny flat-plate area, whereas the bottom of a cylinder (such as a beer mug or traditional glass) offers a large flat-plate area. When a cylinder is inverted, a reverse meniscus occurs which causes a void between the base of the mug and the departing liquid. This vacuum holds the liquid in the glass for a fraction of a second, until a plume of air proceeds up the side of the glass and breaks the vacuum, releasing the liquid. Since the bottom of a pilsner glass is a point, this phenomenon doesn't occur. Hence, you can empty a 1 liter pilsner glass slightly faster that a 1 liter cylinder. A beer bottle or can further complicates this, since in addition to a cylinder flat plate area, it further slows emptying with a small opening that impedes the escape of the liquid. The picture of me drinking from a pitcher (above) was staged as a "photo opportunity" for a local newspaper. I drank out of different (smaller) vessels to set the record. More information on fluid dynamics is here: http://www.ksvinc.com/surface_tension1.htm. Establish a refined drinking technique. I used principles that I had learned studying karate to increase my drinking speed using a practiced and honed drinking technique, similar to a karate kata or practised technique.